Want to be notified of new releases in bentoayr/Efficient-Projection-onto-the-Perfect-Phylogeny-Model? This code implements a generalization of the algorithm described in the paper "Efficient Projection onto the Perfect Phylogeny Model". The input data is of the following form, see the example file for exact formating instructions. When calling the program, the third argument, 0 or 1, indicates whether the columns of M must sum to 1, or sum to something smaller than 1. 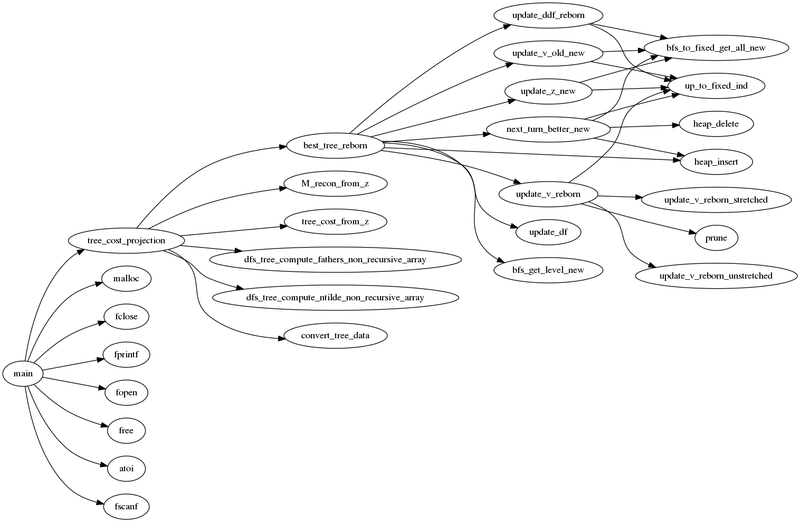 The dependencies of the different functions in the code is described by the following diagram.